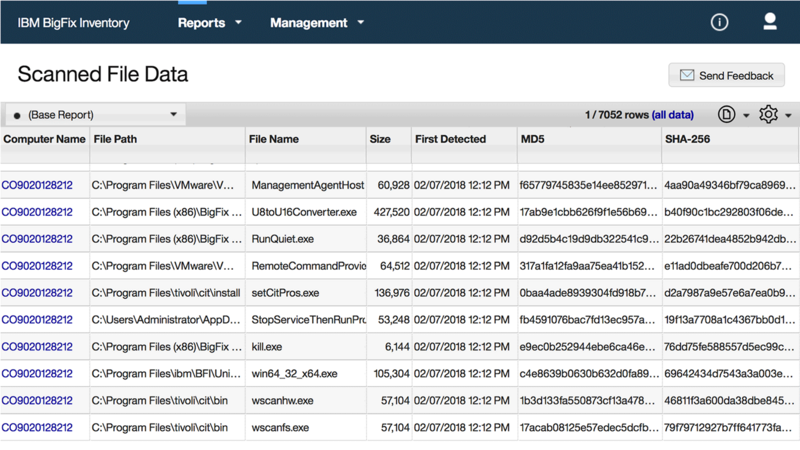 How does IBM BigFix Inventory work? 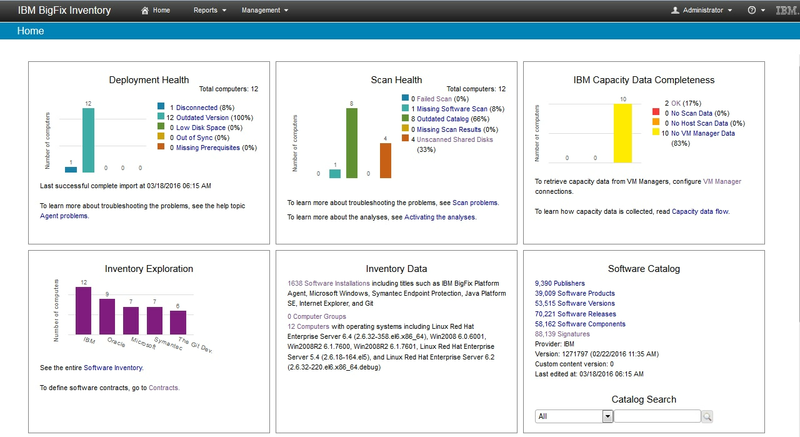 IBM BigFix Inventory offers a single console, single server, single intelligent agent view of all assets that is highly scalable and provides “always-on” software asset management to ensure audit readiness. It helps you manage software assets across hundreds of thousands of endpoints and can be installed throughout the entire enterprise in hours instead of weeks or months. Simplify software identification with information on more than 8,000 software publishers, 40,000 software products and 105,000 application signatures. BigFix combines gathered inventory data with the software identification catalog to create a browsable warehouse and delivers continual updates through a cloud-based update service with information on commercial applications and publishers. It can be easily customized to track home-grown and proprietary applications with no coding required. Get reports on the health and compliance of software assets in minutes—regardless of the size of the environment—with both full reporting and sub-capacity reporting. Gain visibility into software license consumption to help plan software budgets based on inventory and usage trends. BigFix helps you plan for software upgrades and migrations by enabling administrators to determine which endpoints meet prerequisites; and sets security compliance policies for software and system configurations. The solution offers discovery for software, processes, and file systems along with hardware usage and metering to help ensure audit readiness. These capabilities also provide cost savings and reduced security risk by identifying unused software. It allows users to browse data about software license usage to identify unused software and help limit audit and security exposures; and provides aggregated statistics and usage gathered by searching, filtering, sorting, viewing and exporting data. You can integrate BigFix Inventory with other IBM software products to extend management across the full software lifecycle —from procurement through retirement — including security compliance. Combine with IBM Control Desk for comprehensive software asset management—including software license reconciliation, contract management and service management. Or choose IBM BigFix Lifecycle for a complete software management solution and IBM BigFix Compliance for a complete security control solution. 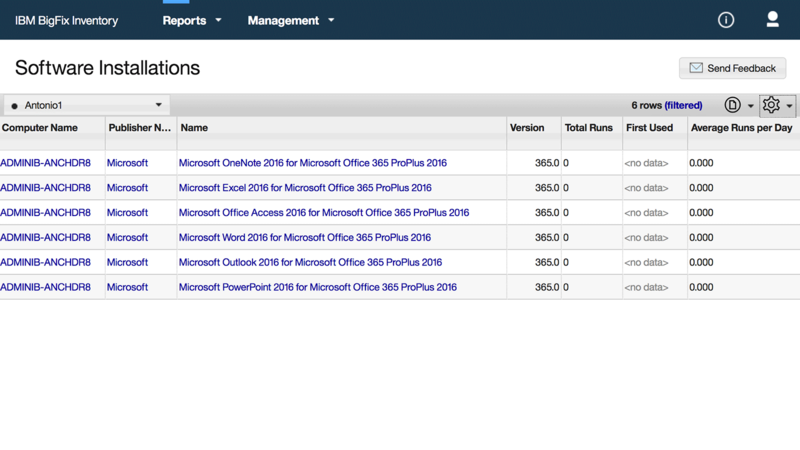 Show the license utilization of products accordingly to the license metric being reported over time. 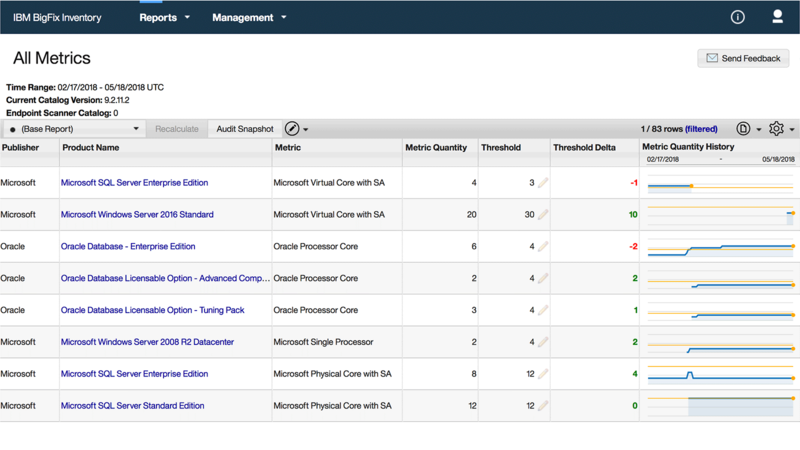 The BigFix All Metrics Report can gather the license utilization of deployed software products, verify usage over time, and compare this to owned license entitlements. 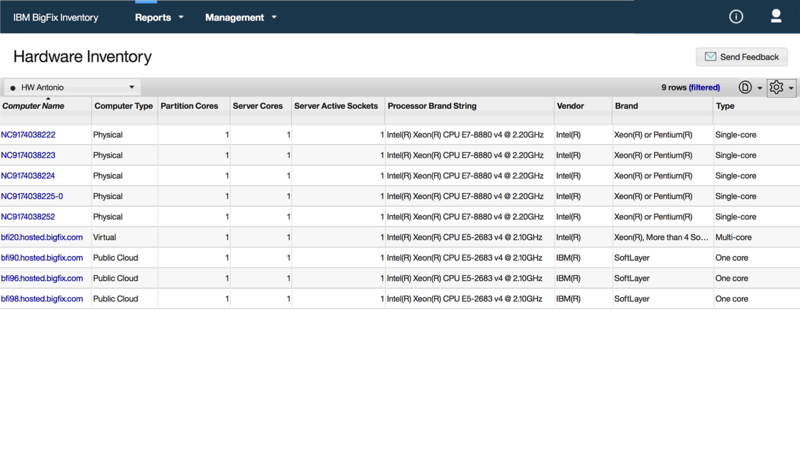 Having a complete inventory view of the managed data center environment (physical servers, virtual servers, on-premise and hosted on public clouds). Software Asset Managers and IT Security Analysts need to located software that is deployed but not being used to respectively reduce software license spend or mitigate security risks. IT can use the hardware Inventory Report to see detailed hardware information gathered by the BigFix Inventory Hardware Scan. This data can easily be extracted into PDF or CSV files or added into external CMDBs via REST APIs. Security Analysts need to identify computers that might be running compromised binaries, or the IT Admin needs to ensure the integrity of binaries deployed in the file system. The Scanned File Report can show the entire list of binary files deployed in the file system per managed computer, including the optionally generated MD5 and SHA256 cryptographic hash keys that can be used as search or filtering criteria. License Managers who are responsible for IBM licensing need to generate reports to meet IBM Passport Advantage Agreement Terms. 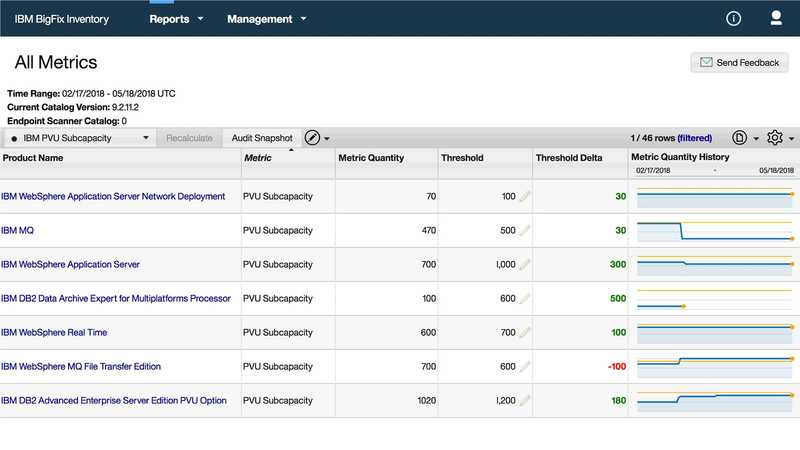 License Managers can use the IBM PVU Sub-Capacity Report to show that IBM products licensed and deployed in the environment are being reported for their license usage.